As you read through the pages of this year’s Triad, we hope the stories open your eyes to the issues facing society today. The media often labels college students as part of the problem, instead of the solution. However, the stories in this magazine prove the statistics and naysayers wrong. Although it is cliché, one person is truly all it takes to make a difference, may you never stop looking for ways to give back. Working on this magazine has been an experience like no other. One can never guess the amount of creative juices needed to produce a quality publication. Although we were a small staff, the members of the Triad were hardworking individuals, who gave there all to create this magazine As a team, we endured long hours, sleepless nights, frustration and endless bouts of laughter along the way; but if these stories touch just one reader, it was worth it. To the contributing writers, thank you, thank you, thank you! Without you, the magazine would cease to exist. 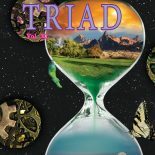 Congratulations to Jon Rosenstadt, the winner of this year’s art contest from which the Triad cover was chosen! To Brenda Medina, you reminded us that there was light at the end of the tunnel. Thanks for r keeping us grounded throughout the process. You‘re the greatest! Much appreciation goes to Michael Mainguth for making sure the computers ran smoothly so we could get our work done; and to the Ybor security staff, for always opening the publication lab with smiling faces whenever we asked. Finally, thank you to our advisers Dr. Richard Gaspar and Valerie Zell for giving us this opportunity. Our very best wishes go out to all HCC students and to our esteemed readers, it is our sincere hope that you never tire in your pursuit of education and that your thirst for knowledge and love of the arts never be quenched. We hope you enjoy the 2009 edition of the Triad!